August is National Breastfeeding Month. For nearly all infants, breastfeeding is the best source of infant nutrition. Breastfeeding also provides health benefits to both the baby and the mother. 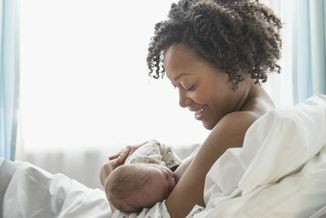 The American Academy of Pediatrics (AAP) recommends that babies should be exclusively breastfed for about the first 6 months, with continued breastfeeding through at least the first year of life and longer as desired by the mother and child. This year's theme—Charting the Course Together—focuses on how we can use data and measurements to build and reinforce the connections between breastfeeding and many other health topics and initiatives. To track the nation’s breastfeeding progress, the CDC’s Division of Nutrition, Physical Activity, and Obesity (DNPAO) uses data from CDC’s National Immunization Survey (NIS). These data allow us to measure whether we are meeting the nation’s breastfeeding targets, as outlined in Healthy People 2020 (HP2020). New data are available! Breastfeeding rates continue to rise in the United States. Nationally, ever breastfeeding exceeded the HP2020 target of 81.9% and is now 82.5%. Breastfeeding at 6 months increased 3.5 percentage points and is now 55.3%. Exclusive breastfeeding through 3 months exceeded the HP2020 target of 46.2% and is now 46.6%. Another exciting addition is that we now have data for 3 U.S. territories: Puerto Rico, Guam, and the U.S. Virgin Islands. Change IS happening, but there is more work to be done. Although more women are breastfeeding and breastfeeding for longer, disparities remain. A recent CDC study describes how breastfeeding rates continue to differ between non-Hispanic black and white infants within states. Addressing such challenges will require coordination and collaboration at all levels – from families to health care providers to communities– so that every baby gets the best start in life.